Until recently the only, and preferred, method for delivery of soft tissue fillers, such as collagen, hyaluronic acid, or autologous fat, to the face and hands has been via a sharp tipped hypodermic needle. However, recent advancements in the production of blunt tipped cannulas, and more specifically micro-cannulas, has set the cat amongst the pigeons and changed this landscape, forever. Options including STERiGLIDE™ from TSK Laboratories provide the next generation in micro-cannulas for the cosmetic sector. Both clinical practitioners and patients are embracing the benefits that blunt micro-cannulas have over their sharper cousins – marking them out as a true ‘game-changer’. While sharp tipped needles are rigid in nature, cannulas are a more flexible option as this means that they can move more freely and easily when delivering precise aesthetic enhancements. To overcome this, the STERiGLIDE™ micro-cannulas offer a solution which is more rigid than many other cannula products, yet still more flexible than a needle – this allows practitioners to control their movements in a more predictable, yet flexible fashion. Cross-section of dermal layer using a sharp need. Sharp needles require multiple entry points to deposit the chosen product in a bolus or linear fashion across a given area. Cannulas can be used through fewer entry points to deposit filler in a fan-like or matrix pattern. This is because they can be pushed through the tissue freely and easily, without cutting. This makes treatment quicker and less painful, without repeated needle entry. Similarly, it causes less swelling and bruising thanks to the reduction in tissue subcision. 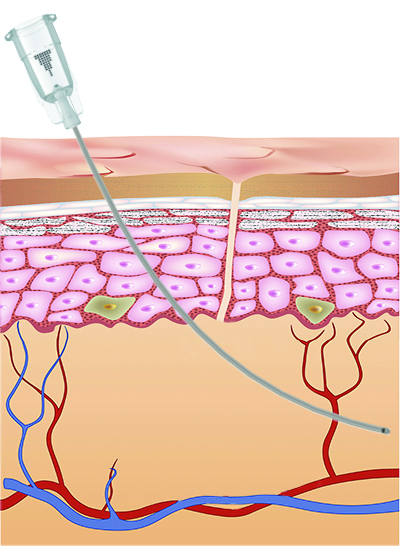 For treatments in more sensitive areas, such as the tear trough, there are many who note that using blunt tipped micro-cannulas is the ONLY sensible option. In a competitive marketplace, where patients are demanding less downtime, the need to deliver more comfortable and less traumatic treatments becomes imperative for practitioners. One clinical study by American Plastic Surgeon, Sam Sukkar M.D. sought to compare the swelling, pain and bruising experienced with a blunt tipped microcannula and a sharp tipped needle for the injection of dermal filler into naso-labial folds. The study of 11 patients concluded that blunt tipped micro-cannulas showed more rapid patient recovery than sharp tipped needles. Pain scales scored at the point of injection were slightly less with the cannula, and swelling was significantly reduced compared to the use of a sharp needle. When thinking about investing in blunt tipped micro-cannulas for your cosmetic practice, it’s important to realize that they are not all the same. There are many aspects to consider which will affect the reliability of the device itself and optimum product placement. From the position of the side port, through which product is extruded, to the shape of the tip, the thinness of the cannula walls, and its external composition which will affect the free movement of the cannula; there is much to take into account. TSK Laboratory offers two distinct types of micro-cannula to the aesthetic marketplace. The traditional CSH (Closed-tip Side Hole) micro-cannula range comes with a round-shaped tip and features ultra-thin walls. TSK’s flagship STERiGLIDE™ range of ultra-thin walled micro-cannulas introduced a domed or tapered shape to its blunt tip. This newly designed tip provides less resistance on cannula entry than a traditional round tip, which in turn reduces friction through the tissue, reduces the force need to introduce the cannula, and minimal bruising for the patient. Combined with a more rigid construction and a proprietary surface treatment to the stainless steel of the shaft, STERiGLIDE™ has a 50% improvement in its ability to glide through the structures. Its side port, the orientation of which is visibly marked on the hub, is also located as near to the tip as possible for accurate product delivery and minimal product loss. All of these design features have made STERiGLIDE™ a cut above traditional micro-cannulas, award-winning and considered by many as the gold standard for blunt-tipped micro-cannulas for use in aesthetic practice.